Snacking with a tropical touch: these delicious Organic Coconut Flakes will give you a dazzling sensation of taste and the power of harvest-fresh coconuts. Such a healthy snack is always welcome. Enjoy those Organic Coconut Flakes pure or mixed with nuts and raisins as finger food. Or add those heavenly fresh Organic Coconut Flakes to your muesli and start your day off right with an exotic breakfast. Also suitable for refining and decorating desserts or savory dishes. 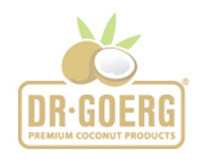 Dr. Goerg Premium Organic Coconut Flakes from monitored organic cultivation are the perfect snack for an active lifestyle. These all-natural flakes are produced within 72 hours of harvest by gently drying and grating the fresh coconut flesh. As an all-natural product of premium quality, our organic coconut flakes are unbleached and free from any artificial flavors or colors and preservatives. They are naturally gluten and lactose-free. Apart from the coconut flakes’ unsurpassed delicious taste, you will also benefit from the fresh and healthful inside of the coconut. It contains many vitamins, beneficial minerals and essential amino acids. Enjoy our delicious organic coconut flakes as a snack or use them for refining your dishes. You could also try them lightly roasted in a pan to intensify their flavor even more. Let yourself be inspired by our recipes and add that special coconutty something to your cuisine!